I have heard so much about the Makeup Revolution eyeshadow palettes, so many good reviews seem to be floating around of them that I had to get one. I was planning on saving this as a treat but I made a small order on amazon and it was the same price as in stores so it ended up in my basket alongside the book I originally made the order for. In Superdrug and on their own website it sells for £7.99, I did pay £8 for it but the extra 1p was made up for by the lack of postage or needing to make a trip to a Superdrug that actually has them in stock. 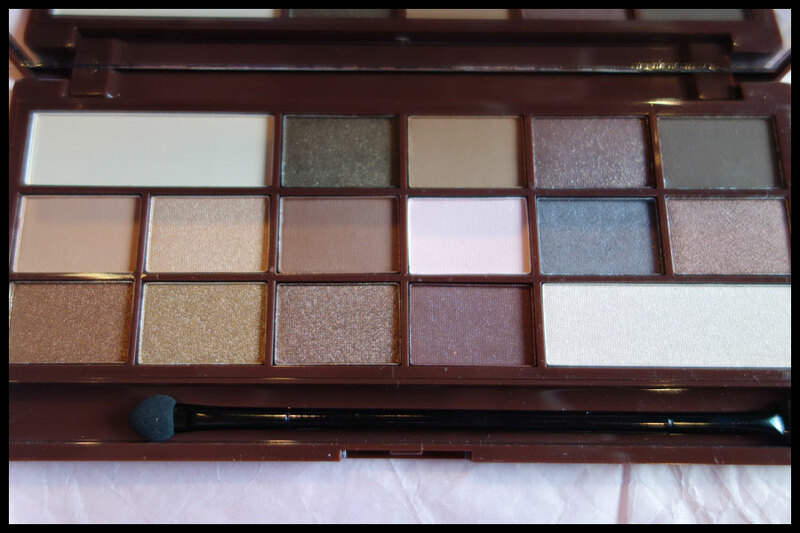 This is the I Heart Chocolate palette and is part of the I Heart Makeup range within Makeup Revolution. When I first saw these on the Superdrug website I thought that I Heart Makeup was the brand rather than Makeup Revolution, it seems like that’s the way Superdrug are selling it. 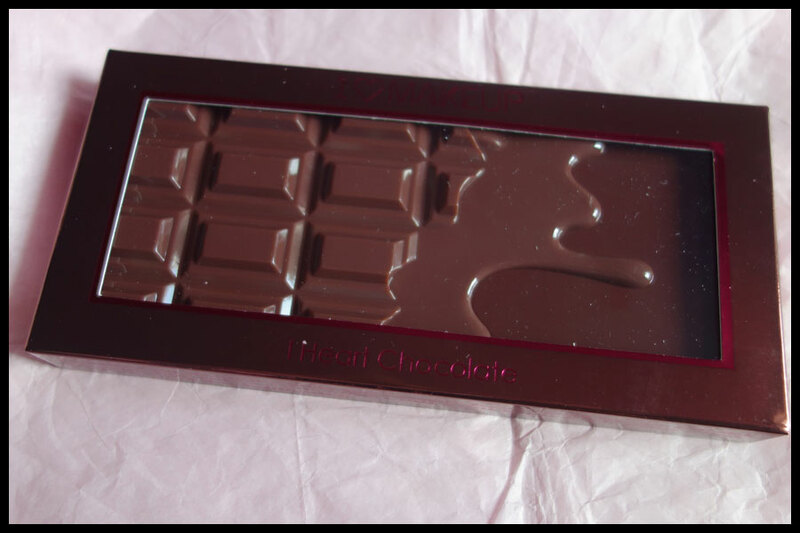 I have read in so many places how this is a dupe for the Too Faced Chocolate Bar palette and wanted to see how good this was and if I could save myself the money of the other by just getting this. The first thing with this one is the outer packaging really lets them down in my opinion. It’s nice enough looking on the front, though the pink writing is hard to read, and the clear window to show the 3D effect of the palette is a nice touch like with some chocolate bars. The back printing, however, makes all the colours look very pink, I would definitely not be buying it going by that alone. If you’ve picked up the palette in store and seen this then don’t worry, the colours inside aren’t as pink though it does give you a good idea of the range in the palette. I love the 3D part melted look of the palette, it doesn’t feel that expensive and it’s hard to open at first but it’s nice just to look at it. The way it clicks shut does make it feel cheap but it holds well and the hinge is stiff enough that it holds itself up at any angle you put it at, seems like it’d be good for travelling. The mirror inside is huge as well, it takes up the whole inside of the cover. The palette is pretty large in surface area but thinner than I expected, the 3D effect does add depth to it but it’d easily fit into a bag or suitcase for travelling if you wanted without it taking up much room. It’s all plastic and feels sturdy enough to survive travelling as well. Inside there is also the sponge applicator that almost every eyeshadow set seems to come with and I never use as well as a clear plastic sheet with the names of the eyeshadows on, they’re all suitably chocolate or love themed, though I would have expected there to be more obviously chocolate ones than there are given the shape of the palette. And now the eyeshadows themselves. I’ve done the swatches on primer and no primer to see the difference and there’s a definite difference between the shimmery ones and the mattes as far as pigmentation goes. I’ve also gone row by row as there are so many and tried to get the photo that gives the closest colour to the actual eyeshadow when on my skin. You Need Love – Matte pale cream colour. It’s not that pigmented but matches my skin tone perfectly as an under brow highlighter. Fairly powdery but does layer well and blend easily, can’t really get it to become opaque though. Stolen Chocolate – Dark cool toned matte brown. Feels creamy and smooth but not very good pigmentation, takes a bit of building up to become opaque. Works well as a blending colour though as blends well. More! – Shimmery warm champagne. Very creamy and opaque with one layer. Blends out well and no fallout from the small particles, a lot finer than the other shimmers. Love Divine – Warm mid coppery brown shimmer. May have a slight pink duochrome but hard to tell, it appears to change colour in the light but it’s very subtle. Very creamy, easy to apply and no fallout. Hard to blend as it can disappear if you’re not careful but is opaque with one layer. Smooth Criminal – Warm mid brown copper/gold shimmer. I can’t see that much difference between this and Love Divine and it seems slightly odd having them both in the palette. This does have a slightly more golden tone to it than the redder colour of Love Divine but unless they’re right next to each other it’s hard to see. Very creamy and smooth to use, opaque with one layer even without primer and blends fairly well with little fallout. 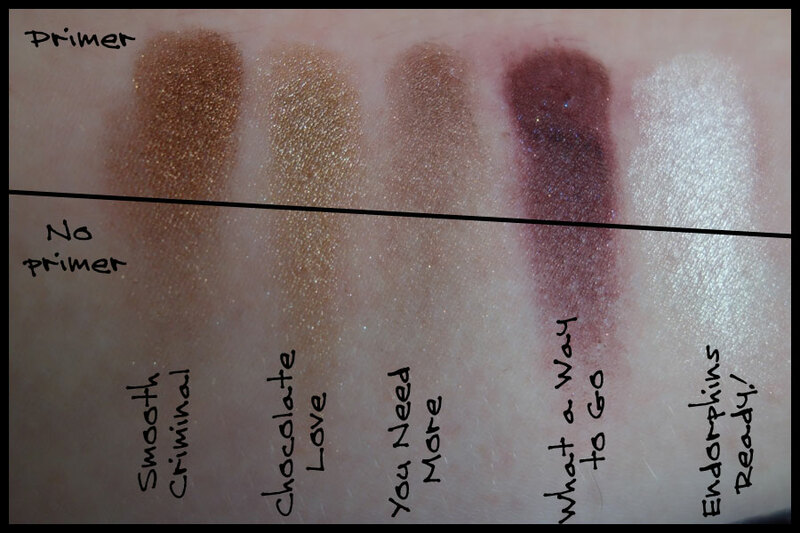 Chocolate Love – Warm or rose gold shimmer. Very pretty rose gold type colour though hard to see from straight on as doesn’t seem that pigmented, from the side it’s very clear though. Creamy, as opaque as it gets with one layer and blends pretty well without any fallout. You Need More – Cooler toned coppery or gold mid brown shimmer. Another similar to Smooth Criminal and Love Divine though maybe slightly pinker if I have to find a difference. It’s somewhere between the two in colour but the base seems to make it feel a cooler tone than either of them. Another nice creamy textured eyeshadow that goes on opaque with little fallout. What a Way to Go – Maroon or purple matte base with multi-coloured shimmer fine glitter/shimmer. Very nice colour in the palette but not that pigmented and rather powdery to use. Doesn’t blend very well, leaves a purple line where it originally was and smudges around it. Another one that’s hard to get off the skin but it does stay well once it’s put there. Endorphins Ready! – Very pale shimmery warm cream. It’ shard to tell if this is cream or white or maybe pale pink as it’s a pretty warm colour to me and has the shimmery look of More! But a few shades paler and a good highlight colour. Very creamy, opaque with one layer, blends well and little fallout. I would say that, although this is a nice enough palette, it’s one that I found a bit of a let down considering what I’ve been reading and seeing about the company. It’s one of those times where something seemed to be so hyped up that it would be hard to live up to those expectations. There do seem to be some colours which are an odd choice given how close they are to each other but if this was trying to be a dupe of the Too Faced palette then maybe they’re the colours that were in that. I haven’t seen that in person yet and I think I’ll still be getting it as a treat at some time, maybe I’ll compare the two. Compared to companies in a similar price range, I have a few sleek and MUA palettes, I would say this probably isn’t quite up to the quality of theirs, at least when it comes to consistency. 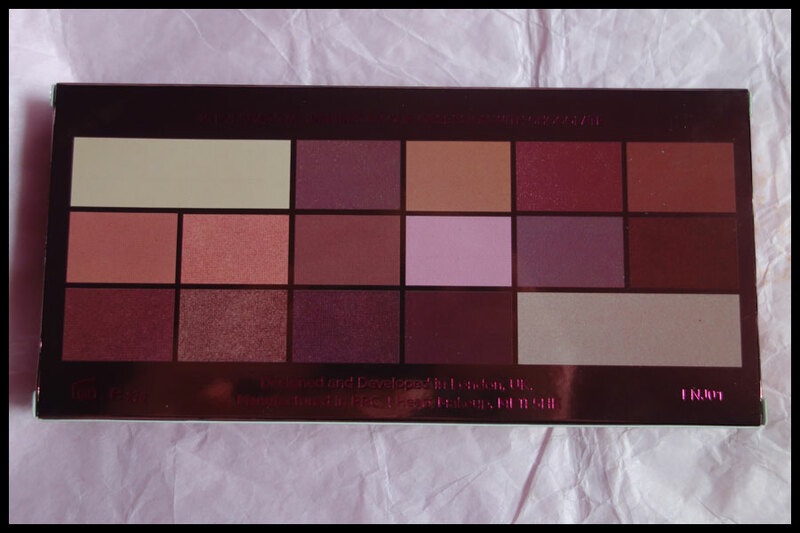 There are a few duds in every palette really, especially at the under £10 mark, but this one seemed to have more duds that it did good colours. 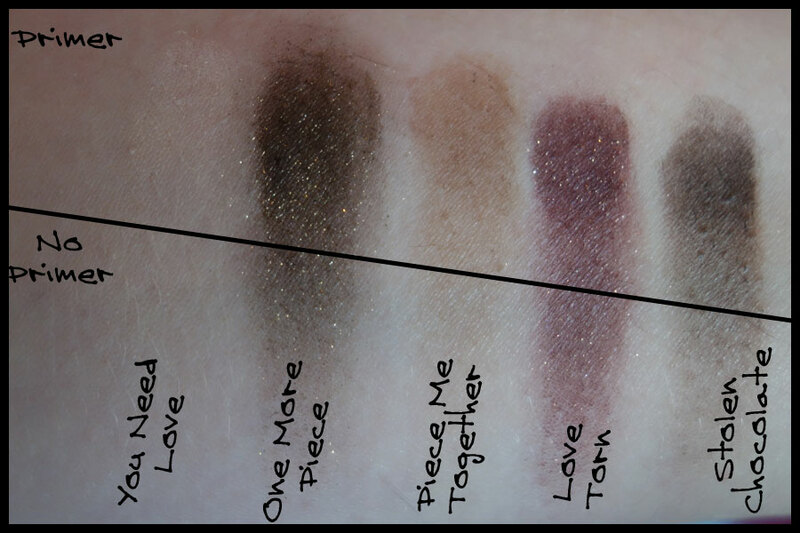 The good colours that there were are either mattes which are lovely and creamy but not as pigmented as I would have liked or are the shimmery eyeshadows and there are three very close in colour. Also a lot of these are colours that I have good dupes of in my Sleek and MUA palettes. I’m not saying that all the Makeup Revolution palettes are like this, I have one I got free with a beauty box a while ago that I find better pigmented than this, and I might try some of theirs in the future given how popular they seem to be but I’m not rushing out to buy more like I thought I might. Overall I’d say this is an ok palette, it’s not convinced me that I need the other two chocolate bar palettes they do, though I may be tempted by the white chocolate one at some point, mainly due to the packaging though. If you want a cheap neutral palette with a good range of colours and a few that are different to the standard neutral palettes you get then this might be worth a look. If you need them to all be well pigmented and blendable then this probably isn’t the palette for you. I’d say most are blendable with a few exceptions but the pigmentation isn’t great on a lot of them unless you built it up quite a bit. 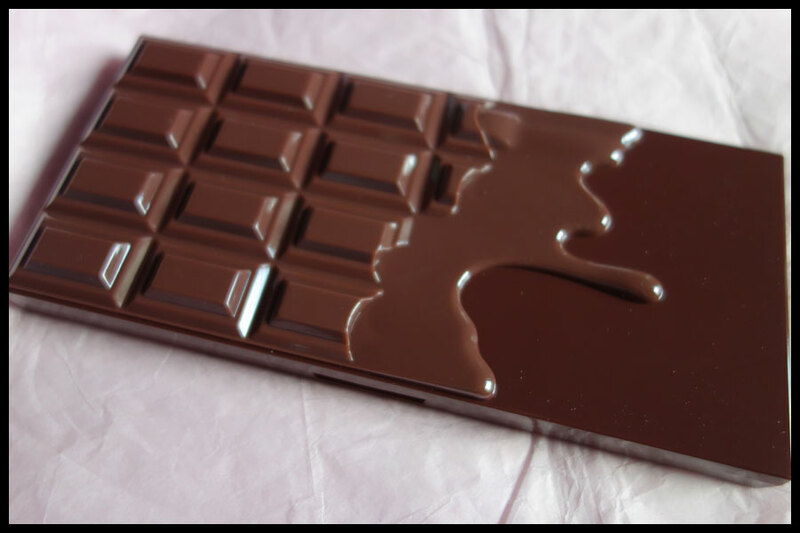 It’s a nice enough palette, especially for the price, it’s just not as nice as I expected it to be with people saying it’s a good dupe for the Chocolate Bar palette. That was a great review – very honest, and appreciated! Thanks 🙂 glad it was helpful.